or does it stay in play? into play from the discard pile? purposes of card effects that reference it. your discard pile with cost X or lower. If you have the Screams from Within Yog-Sothoth, would you ever bother to use the Core Yog-Sothoth instead? I guess the Core card could get pretty cheap if you cast a lot of spells, but the Screams version starts out cheaper, and it gets you your spells back. 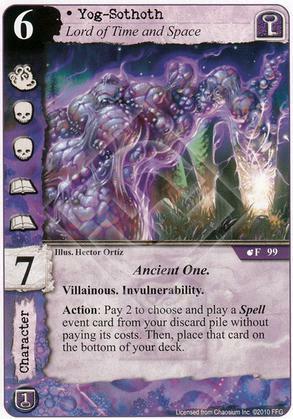 Given that you could only have one in play at any given time, could you theoretically build both versions into a deck for a total of six Yog-Sothoth cards? I think the Core version is still usable, but only if you really pack the deck with Spells to get his price low. Same icons, but the Core version has +1 skill, and I usually end up paying 4 for him. Not having to raise a domain up to 6 let you keep a couple extra cards which is nice and you can turn your attention to the other domains faster. Yes, you can put 3x copies of both into a deck (it's legal) but you can still only have one total copy in play (either one, but not both). So, it's probably not in your best interest as you'd end up with a lot of dead cards and too many unplayable cards early in the game. You cannot put more than 3 of a card with a given title. It is stated in the rulebook that other subtitle is still the same card. You can have 2 of one kind and 1 of another, but max 3 total. This guys cost of 6 is actually higher than Cores cost of 8 when there are enough spells. Things in the Ground (SoA). Ah, you're right. I forgot that the 3x thing was limited by name rather than card - my mistake. Does Yog's special ability work with Tesla? I could see it counting only as a triggered effect by Yog and not by the card in the discard pile, but you are playing the spell from the discard pile without paying its cost. Does this mean you are triggering the spell's effect from the discard pile?